B lymphocytes are activated upon Ag sensing by BCRs. The substrate presenting the Ag can show different degrees of stiffness. It is not clear whether B cells can respond to changes in substrate stiffness. In this study we use high-resolution, high-speed live cell imaging techniques to capture the molecular events in B cell activation after the recognition of Ags tethered to polyacrylamide gel substrates with variable degrees of stiffness as quantified by Young’s modulus (2.6–22.1 kPa). We show that the initiation of B cell activation is extremely sensitive to substrate stiffness. B cells exhibit much stronger activation responses when encountering Ags tethered to substrates with a high degree of stiffness as measured by the accumulation of BCR, phospho-spleen tyrosine kinase, and phosphotyrosine molecules into the B cell immunological synapse. 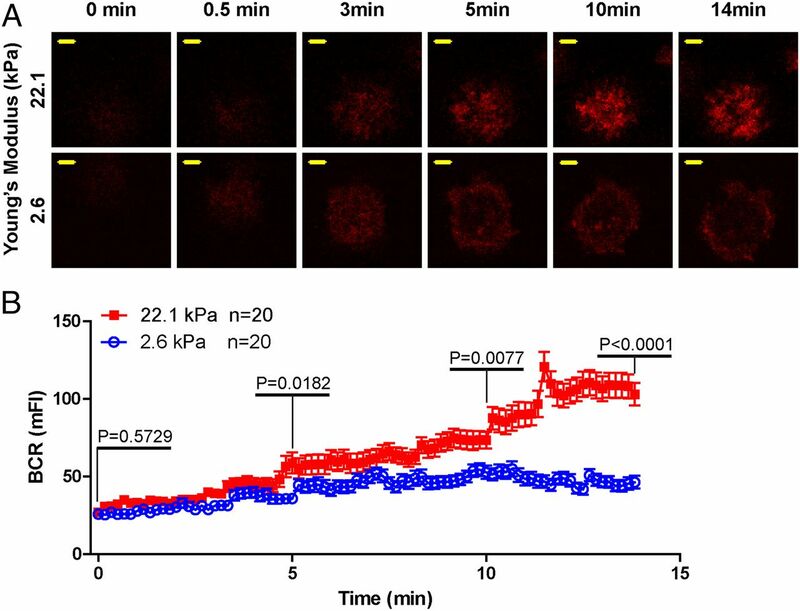 Ags tethered to stiff substrates induce the formation of more prominent BCR and phospho-spleen tyrosine kinase microclusters with significantly enhanced colocalization as compared with Ags tethered to soft substrates. Moreover, the expression of the B cell activation marker CD69 is enhanced in B cells encountering Ags on stiffer substrates. Through time-lapse live cell imaging, we find that the different responses of B cells to substrate stiffness are only demonstrated 5 min after BCR and Ag recognition. Using a series of cytoskeleton inhibitors, we determine that the mechanosensing ability of B cells is dependent on microtubules, and only mildly linked to the actin cytoskeleton. These results suggest the importance of the mechanical properties mediated by substrate stiffness in B cell activation. B lymphocytes are the immune cells that are primarily responsible for the Ab response. Upon recognition of foreign Ags, the activation of B cells is initiated, which is subsequently linked to B cell proliferation and differentiation into plasma cells and memory B cells (1). B cells recognize the foreign Ags through their surface-expressed BCRs. The BCR is composed of a membrane-bound form of the Ig and a noncovalently associated heterodimer of Igα and Igβ in a 1:1 membrane-bound form of the Ig/Igα-Igβ heterodimer stoichiometry (2, 3). It is well appreciated that Ags show great diversity based on their presentation formats, including Ag density (4, 5), Ag affinity (4, 5), Ag valency (6–8), and Ag mobility (9). The initiation of B cell activation has been shown to be sensitive to each type of these Ag presentation formats. For example, early studies extensively investigated how Ag valency can affect B cell activation (10–12) and the subsequent Ab responses (6–8). It is generally observed that multivalent Ags with high valency are more potent in inducing Ab responses as compared with monovalent Ags with low valency. Recent advances in applying high-resolution, high-speed live cell imaging techniques to B cell biology studies have significantly improved our understanding of how Ag presentation formats can affect the initiation of B cell activation. Ag density and Ag affinity are demonstrated to be key factors in influencing the initiation of BCR signaling. Fleire et al. (5) reported that the two-phase spreading and contraction responses of B cells following the encounter of membrane-bound Ags are sensitive to both Ag density and Ag affinity. Our early studies suggested that the formation and dynamic growth features of BCR microclusters in the initiation of B cell activation are also sensitive to the Ag presentation formats of Ag density, affinity, and mobility (4, 9). Thus, through their surface-expressed BCRs, B cells are capable of sensing a wealth of antigenic information, including Ag valency, affinity, density, and mobility. It is not clear whether B cells have mechanosensing ability toward the substrate presenting the Ags; however, experimental evidence suggests that they do. Recent live cell imaging studies by other laboratories, as well as our own, showed that the formation of BCR microclusters and the B cell immunological synapse are two key early events in the initiation of B cell activation (1, 4, 5, 13). Subsequent studies demonstrated that reorganization of the B cell cytoskeleton provides indispensable support for both of these events in the process of B cell activation by maintaining the dynamic growth feature of BCR microclusters and the coalescence of BCR microclusters and signaling molecule microclusters (4, 14–16). Moreover, the centripetal movements of BCR microclusters to the center of the B cell immunological synapse are shown to depend on the coordination of the cytoskeleton, motor proteins, and BCR signaling molecules (15). Interestingly, the membrane cytoskeleton and motor proteins have been shown to be key players in regulating cell mechanics and morphology changes (17–19). Based on this information, it is reasonable to speculate that the BCR might have mechanosensing ability toward the substrate presenting the Ags that may allow it to regulate these molecular events in the cascades of B cell activation. This speculation is also supported by two recent reports on T cell mechanosensing capability (20, 21). An obviously related question is how likely is it that the substrate presenting the Ags will show different stiffness features in vivo, or that there will be microenvironments with different stiffnesses that B cells might encounter? The answer to this question also seems to be yes. It is well appreciated that the substrate presenting the Ags to B cells can be quite diverse (22). For example, Ags can be presented on the surface of rigid virus capsid vesicles that may exhibit high stiffness features, presented on the membrane of the enveloped virus particles that may show medium stiffness features, or presented in a soluble format, as in the case of secreted pathogen Ags that may exhibit very low stiffness features. Thus, it is highly possible that B cells can detect a diversity of stiffnesses of Ag-presenting substrates. From this point of view, it will be meaningful to investigate the mechanosensing ability of B cells and to address how such an ability can in turn regulate B cell activation events upon Ag recognition by the BCRs. In this study, we established an experimental system to answer these questions. We used common polyacrylamide gel substrates with variable Young’s modulus (stiffness), including high, medium, and low stiffness (22.1, 7.4, and 2.6 kPa, respectively), to present Ag. We used high-resolution, high-speed live cell imaging techniques to examine early B cell activation events occurring seconds after Ag recognition by the BCRs. We also evaluated the extent of B cell activation by quantifying the surface expression of the B cell activation marker CD69, which is a cell surface activation marker that increases in expression on most hematopoietic cells after encountering Ags (23–25). We find that the initiation of B cell activation is indeed extremely sensitive to substrate stiffness. When encountering Ags tethered to substrates with high stiffness, B cells exhibit much stronger activation responses by showing significantly enhanced accumulation of BCR, phospho-spleen tyrosine kinase (pSyk), and phosphotyrosine (pTyr) signaling molecules into the B cell immunological synapse. Moreover, the formation of BCR microclusters, the basic platform for the initiation of BCR signaling, is also highly sensitive to substrate stiffness. We find that Ags tethered to stiff substrates induce the formation of more prominent BCR and pSyk (or pTyr) microclusters, with significantly enhanced colocalization as compared with Ags tethered to soft substrates. The expression of the B cell activation marker CD69 is significantly enhanced in B cells encountering Ags tethered to substrates with high stiffness. With the help of high-speed time-lapse live cell imaging, we determine that the differences in B cell responses are only evident 5 min after Ag recognition by the BCRs. Using a series of cytoskeleton inhibitors, we determine that the mechanosensing ability of B cells is dependent on microtubules, but only mildly linked to the actin cytoskeleton network. These results suggest the importance of mechanosensing capabilities of B cells in the initiation of B cell activation, which may facilitate the development of better vaccines and cures for autoimmune diseases or B cell tumors that are induced by abnormal B cell activation. Primary B cells or the B1-8–specific B cells were isolated from spleens of BALB/c mice or the IgH B1-8/B1-8 Igk−/− transgenic mice as reported previously (4). Purified biotin-conjugated Fab fragment goat anti-mouse IgM Abs and biotin-conjugated goat F(ab′)2 fragment anti-human IgM Abs were purchased from Jackson ImmunoResearch. Fluorophore-conjugated anti-human IgM C region or anti-mouse IgM C region Abs were also purchased from Jackson ImmunoResearch. Acrylamide-modified streptavidin was purchased from Invitrogen Life Sciences; 3-aminopropyltrimethoxysilane was purchased from Sigma-Aldrich. Polyacrylamide gel substrates were prepared and attached to glass coverslips following a well-established method (26, 27). Briefly, glass coverslips were treated with NaOH, 3-aminopropyltrimethoxysilane, and glutaraldehyde in a step-by-step manner. After washing extensively in distilled H2O, the glass coverslips were ready to support the polyacrylamide gels. The rigidity of the polyacrylamide gel substrate was controlled by using different amounts of bis-acrylamide cross-linker while keeping the total acrylamide concentration constant at 10% (w/v). In this study, polyacrylamide gels with different Young’s modulus were produced by using bis-acrylamide concentrations of 0.8, 0.4, and 0.05% (w/v). Ags were tethered to the surface of polyacrylamide gel substrates following the methods described previously (20). In this study, streptavidin-conjugated acrylamide was polymerized into the polyacrylamide gel for the purpose of tethering the biotinylated F(ab′)2 anti-IgM Ab as surrogate Ag, which was generally incubated with the substrate at 37°C for 30 min at a concentration of 30 μg/ml. After extensive washing, the polyacrylamide gel substrates tethering specific Ags were ready for use. To verify the exact concentration of Ag tethered to the gel surfaces, Alexa Fluor 647–conjugated biotinylated F(ab′)2 anti-IgM surrogate Ags were used in the incubation step, and images of the polyacrylamide gel surfaces were acquired by confocal fluorescence microscopy. To examine the Ag accessibility to B cells, we incubated 100 nM Alexa 488–conjugated mouse IgM molecules (Santa Cruz Biotechnology) with either 22.1 or 2.6 kPa gels presenting anti-mouse IgM surrogate Ag and acquired the images by confocal fluorescence microscopy. The mean fluorescence intensity (MFI) of the tethered Ags or Alexa 488–conjugated mouse IgM molecules on the surfaces of the polyacrylamide gel substrate was quantified by ImageJ (National Institutes of Health, Bethesda, MD) software using the protocol described previously (4). The Young’s modulus of each polyacrylamide gel substrate was measured using an Agilent atomic force microscope following the standard protocol reported in our previous studies (28, 29). Briefly, an 11.2-μm-diameter sphere was glued to the end of a silicon nitride tip (spring constant of 0.093 N/m). Young’s modulus was calculated by converting the force/displacement curves into force/indentation curves and fitting with the Hertz model (29). B cells (5 × 105) were placed on either 22.1 or 2.6 kPa gels, with or without tethered anti-IgM surrogate Ags for 10 min at 37°C, 5% CO2, and then imaged by microscope with a 10× objective lens to quantify the amount of B cells on the gel substrate. Subsequently, we washed the gels thoroughly at flow speeds of 0.5, 1, 2, or 2.5 ml/s for a total amount of 10 ml PBS with 1% FBS washing buffer, and then imaged again the amount of B cells still adhered to the gel substrate. Because the entire area of the polyacrylamide gel can be captured under the 10× objective lens, the exact same area was used to quantify the amount of B cells on the gel substrate before and after the washing step. Mathematically, we quantified the ability of the B cells to adhere to the gel substrate using a parameter termed “percentage of adhesion,” which is calculated using the equation: percentage of adhesion = cell density on gel substrate after washing/cell density on gel substrate before washing. B cells were placed on the surface of polyacrylamide gel substrates with tethered Ags for 10 min at 37°C, 5% CO2, and then fixed with 4% paraformaldehyde. Unless otherwise indicated, all images were captured by a spinning disk confocal fluorescence microscope with a 40× objective lens. Time-lapse images were acquired immediately after the B cells encountered Ags tethered to polyacrylamide gel substrates. The acquisition was controlled by Andor iQ2 software. The exposure time was 100 ms unless otherwise indicated. Images were analyzed using ImageJ and Matlab (Mathworks) software as reported in our previous studies (4, 30). The MFI value of BCR, pSyk, or pTyr molecules within the immunological synapse was calculated on the basis of mean pixel intensity by ImageJ software. Briefly, images were subtracted for background and then marked with regions of interest. The MFI values obtained were the ratio of integrated fluorescence intensity of the regions of interest to the total area of pixels in the same regions of interest. Recruitment of pSyk or pTyr into the immunological synapse of Ramos or mouse primary B cells upon encountering Ags tethered to substrates with high or low stiffness was imaged after intracellular staining with phospho-Zap70 (Tyr319)/Syk (Tyr352) Ab (Cell Signaling Technology) or FITC-conjugated anti-pTyr (clone 4G10; Upstate Biotechnology) as previously described (4). Briefly, B cells were placed on polyacrylamide gel substrates with tethered Ags, fixed with 4% paraformaldehyde, permeabilized with 0.1% Triton X-100, and pretreated with blocking reagent. Subsequently, these B cells were stained with phospho-Zap70 (Tyr319)/Syk (Tyr352) Ab, followed by secondary Ab staining with Alexa Fluor 647–conjugated F(ab′)2 goat Abs specific for rabbit IgG (Invitrogen) or stained directly with FITC-conjugated anti-pTyr. Images were analyzed by Image J and Matlab software as described previously (4). The 2D Gaussian mathematical fitting yields several key parameters for each microcluster, including the local background FI (z0), integrated FI (I), position (xc, yc), and full width at half-maximum peak height of the intensity distribution in the x and y direction, respectively (σx, σy). For the intensity and size analyses of BCR or pSyk microclusters, arithmetic means and SEs of the values of the respective parameters were calculated. Human Ramos or mouse primary B cells were placed on planar polyacrylamide gels of high or low stiffness presenting surrogate Ags for an extended amount of time (24 h). During this period of time, complete culture medium was used. After that, B cells were removed from the substrates by rigorous washings. B cells were stained with FITC hamster anti-mouse CD69 or FITC mouse anti-human CD69 (BD Biosciences) on ice. After washing with prechilled PBS, the expression level of CD69 was examined by flow cytometry analyses using FACSCalibur (BD Biosciences). For inhibitor studies, Ramos B cells were pretreated with three cytoskeleton inhibitors, including latrunculin B (Calbiochem), nocodazole (Sigma-Aldrich), or colchicine (Fluka Biochemicals), before the imaging experiment as reported earlier (4). Briefly, Ramos B cells were pretreated with 1 μM latrunculin B at room temperature for 10 min to block actin polymerization. Ramos B cells were pretreated with 2 μM nocodazole for 1 h at 4°C, followed with another 30 min at 37°C to disrupt microtubule filaments. Ramos B cells were pretreated with 100 μM colchicine at room temperature for 30 min to disrupt microtubule filaments. As a control, Ramos B cells were pretreated with DMSO for 1 h at 4°C, followed by another 30 min at 37°C. Polyacrylamide gels have been widely used to produce planar substrate surfaces with different rigidities by varying the amount of bis-acrylamide crosslinker. In this study, we used 0.8, 0.4, and 0.05% of bis-acrylamide crosslinker to yield a set of polyacrylamide gels with a bulk Young’s modulus of 22.1 ± 2.7, 7.4 ± 2.4, and 2.6 ± 1.3 kPa, respectively (Fig. 1A). When preparing the polyacrylamide gels, streptavidin-conjugated acrylamide was used in a mixture with nonconjugated acrylamide for the purpose of tethering Alexa Fluor 647–conjugated biotinylated F(ab′)2 anti-IgM surrogate Ags on gel surfaces (Fig. 1B). The polyacrylamide gels produce a layer of activating Abs as shown in reconstructed three-dimensional confocal images (Fig. 1B). In early studies, Ags tethered to planar surfaces of either fluid lipid bilayer or glass cover slides have been shown to efficiently induce the signaling cascades of B cell activation (4, 5, 9). We thus used the Ags tethered to the planar surface of polyacrylamide gels with varying stiffnesses to assess the extent of B cell activation. Although three-dimensional confocal microscopy revealed a lateral distribution of the tethered Ags that was planar and highly uniform (Fig. 1C, red area), we noticed that the density of Ag tethered to the gel surface differed greatly even when using the same percentage of streptavidin-conjugated acrylamide molecules in each gel of a particular stiffness (data not shown). Because the initiation of B cell activation has been demonstrated to be sensitive to Ag density in early studies of ours and others (4, 5), we adjusted the concentration of streptavidin-conjugated acrylamide in 2.6 and 7.4 kPa gels to produce an Alexa Fluor 647–conjugated F(ab′)2 anti-mouse IgM surrogate Ag layer with an Ag density that was comparable to the 22.1 kPa gels (Fig. 1D). Ags tethered to polyacrylamide gel substrates with different stiffnesses show the same density and accessibility. (A) Young’s modulus value for the polyacrylamide gel substrates exhibiting different stiffnesses. Each dot represents a single measurement by atomic force microscopy. Bars represent mean ± SD. Two-tailed t tests were performed for statistical comparisons. (B) Reconstructed three-dimensional confocal image showing the layer of tethered Ags (red) on the surface of a 0.15-mm-thick polyacrylamide gel substrate. Scale bar, 5 μm. (C) Merged two-color images showing the contact interface of a single B cell (green, but shown as yellow in merged image) placed on the surface of the polyacrylamide gel tethering the cognate Ags (red). Scale bar, 5 μm. (D) Quantification of Ag density on the surface of the polyacrylamide gel substrates with different stiffnesses. Each dot represents a single measurement for the MFI of Ag density obtained using ImageJ software. Bars represent mean ± SD. Two-tailed t tests were performed for statistical comparisons. (E) Quantification of the MFI of Alexa Fluor 488–conjugated mouse IgM molecules to compare the accessibility of goat anti-mouse IgM surrogate Ag tethered to polyacrylamide gels with either 22.1 or 2.6 kPa Young’s modulus values. Each dot represents a single measurement for the MFI of Alexa Fluor 488–conjugated mouse IgM density obtained using ImageJ software. Bars represent mean ± SD. Two-tailed t tests were performed for statistical comparisons. Besides Ag density, Ag accessibility to B cells will also significantly affect the initiation of B cell activation. In the system using polyacrylamide gels, Ag accessibility had to be extensively examined to avoid inadvertently altering accessibility to Ag when varying the stiffness feature of the gels. We performed two independent experiments to assess the accessibility of Ag to B cells on 22.1 versus 2.6 kPa gels. First, we incubated 100 nM Alexa Fluor 488–conjugated mouse IgM molecules with either 22.1 or 2.6 kPa gels presenting anti-mouse IgM surrogate Ag and showed that the Ag layers on either of the gels are equally accessible to mouse IgM molecules (Fig. 1E). Second, we placed the same amount of human Ramos B cells on either 22.1 or 2.6 kPa gels, with or without tethered anti-human IgM surrogate Ags, for 10 min and then thoroughly washed the gels at flow speeds of 0.5, 1, 2, or 2.5 ml/s using 10 ml PBS/1% FBS washing buffer (Fig. 2A–E). For each condition, we showed that human Ramos B cells can adhere to the polyacrylamide gels in a comparable manner regardless of substrate stiffness (Fig. 2B–E). Unexpectedly, we found that Ramos B cells show comparable abilities to adhere to polyacrylamide gels with or without tethered surrogate Ags (Fig. 2B–E). It is known that tumor cells may significantly change their adhesive features, depending on the substrate (32). Thus, to ensure that these observations are not unique to laboratory B cell lines, we repeated the experiment using freshly isolated murine primary B cells at a washing speed of 2 ml/s (Fig. 2F). Some similar observations were obtained, although indeed primary B cells have a relatively weaker ability to adhere to polyacrylamide gels (∼50% adhesion) as compared with the Ramos B cell line (∼80% adhesion) (Fig. 2F). These results show that adhesion of B cells to the substrate is independent of the Ags. To determine whether Ag-independent adhesion of B cells to polyacrylamide gels could induce characteristics of B cell activation, we examined the accumulation of BCRs into the contact interface between the B cells and the gels with or without tethered Ags (Fig. 2G, Supplemental Fig. 1). The results showed that although B cells adhere to polyacrylamide gels in these two conditions equally well, only the gels presenting the Ags trigger the accumulation of BCRs (Fig. 2G, Supplemental Fig. 1A). B cells similarly adhere to polyacrylamide gels with or without the presentation of Ags, but only accumulate BCRs into the contact interface with Ag-tethering polyacrylamide gels. (A) Representative images showing the adhesion of B cells to polyacrylamide gel substrates before and after washing with 10 ml PBS/1% FBS buffer. Scale bar, 20 μm. (B–E) Statistical quantification of the percentage of human Ramos B cells adhered to polyacrylamide gel substrates with high (22.1 kPa) versus low (2.6 kPa) stiffness. Percentage of adhesion is used for quantification, as detailed in Materials and Methods. Also presented is a comparison of the percentage of Ramos B cells adhered to substrates with tethered Ags, versus without. The results using four different washing speeds of 0.5, 1, 2, or 2.5 ml/s for a total amount of 10 ml PBS/1% FBS washing buffer are given. Bars represent mean ± SD from at least nine independent cell countings. Two-tailed t tests were performed for statistical comparisons. (F) Statistical quantification of the percentage of mouse primary B cells adhered to polyacrylamide gel substrates under different experimental conditions, but the same washing speed of 2 ml/s. Bars represent mean ± SD from at least nine independent cell countings. Two-tailed t tests were performed for statistical comparisons. (G) Statistical quantification of the MFI of BCRs within the immunological synapse of Ramos B cells on polyacrylamide gel substrates (22.1 kPa) with or without tethered Ags. Each dot represents one measurement from a single cell. Bars represent mean ± SD from two independent experiments. Two-tailed t tests were performed for statistical comparisons. All the end point images were acquired 10 min after the B cells were placed on Ag-containing polyacrylamide gels. Thus we established an experimental system to present anti-IgM surrogate Ags at a consistent Ag density, but with distinct, varying degrees of substrate stiffness to examine the mechanosensing ability of B cells and assess how such capabilities can regulate the molecular events in the signaling cascades of B cell activation. Our early studies have shown that BCRs that are initially distributed evenly on the cell surface will become polarized and accumulate into the contact area between the cell and the planar Ag-presenting surface, forming the typical B cell immunological synapse (1, 4). The B cell immunological synapse is a critical structure for the initiation of signaling and the acquisition and subsequent internalization of foreign Ags. We thus examined how the formation of the B cell immunological synapse is affected by Ags tethered to the substrates with different stiffnesses. We prestained Ramos human B cells with Alexa Fluor 568–conjugated Fab anti-human IgM C region and placed them on the polyacrylamide gels with a Young’s modulus of 22.1, 7.4, or 2.6 kPa. Biotin-conjugated F(ab′)2 anti-human IgM was tethered to the surface of these gels of varying stiffness at the same Ag density (Fig. 1C, 1D). Ten minutes later, we fixed and permeabilized the cells and stained them with pSyk- or pTyr-specific Abs. Images of the contact interface between the B cells and the Ag-containing planar gels were acquired by confocal fluorescence microscopy. We observed the formation of a typical B cell immunological synapse with the accumulation of BCR and signaling molecule microclusters into the contact interface between the B cells and the Ag-containing planar gels (Fig. 3A, 3B). We quantified the accumulation of BCR, pSyk, and pTyr molecules into the B cell immunological synapse using an image analysis method reported in our earlier studies (30). We found that Ags tethered to the substrate with higher stiffness significantly enhanced the accumulation of BCR (Fig. 3C), pSyk (Fig. 3D), and pTyr (Fig. 3E) molecules into the Ramos B cell immunological synapse, with 22.1 kPa Ag demonstrating the greatest accumulation and 2.6 kPa Ag the least (Fig. 3). To ensure that these observations were not features exclusive to Ramos human B cells, we similarly examined the response of freshly isolated mouse primary B cells to Ags tethered to substrates with different stiffnesses. We confirmed that mouse primary B cells accumulated more BCR (Fig. 4A), pSyk (Fig. 4B), and pTyr (Fig. 4C) molecules into the B cell immunological synapse when encountering Ags tethered to substrates with high stiffness (Fig. 4). Recruitment of BCR, pSyk, and pTyr to the mouse primary B cell immunological synapse induced by Ags tethered to substrates with different stiffnesses. 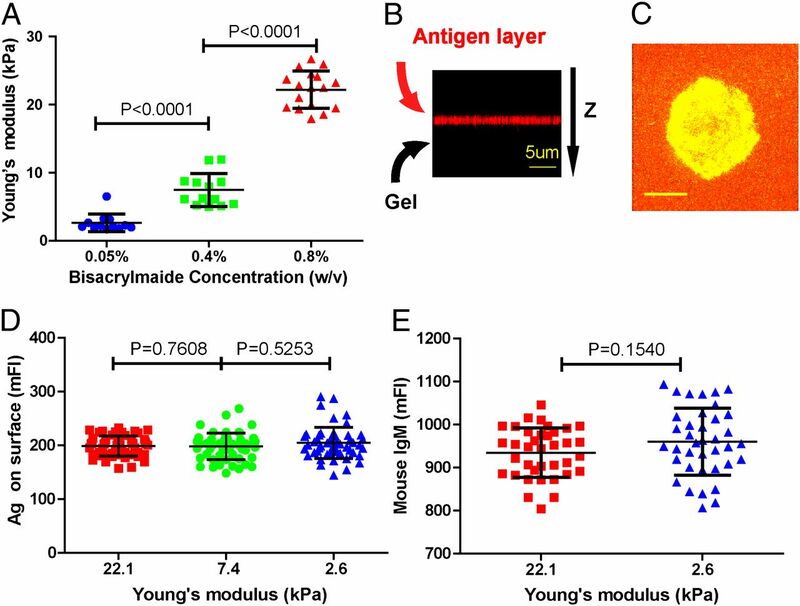 (A–C) Statistical comparison of the MFI of BCR (A), pSyk (B), and pTyr (C) within the immunological synapse of BALB/c mouse primary B cells encountering Ags tethered to polyacrylamide gel substrates with different stiffnesses. Each dot indicates one cell analyzed in three independent experiments. Two-tailed t tests were performed for statistical comparisons. All the end point images were acquired 10 min after the B cells were placed on Ag-containing polyacrylamide gels. These results suggest that the initiation of B cell activation is very sensitive to substrate stiffness. Clearly, Ags presented on substrates with high stiffness substantially facilitate the formation of the B cell immunological synapse and the initiation of B cell activation compared with Ags presented on substrates with low stiffness. BCR microclusters have been demonstrated to serve as the most basic platform in the initiation of BCR signaling by our studies and those of others (1, 13). We thus quantified the FI and size of each individual BCR microcluster induced by Ags tethered to substrates with high or low stiffness. We mathematically fitted each BCR microcluster using a 2D Gaussian function as reported earlier (4). By doing this, we were able to use the parameters from the 2D Gaussian function to quantify the BCR microclusters (Fig. 5A). Specifically, for each BCR microcluster, the integrated FI defines the amount of BCRs accumulated into each BCR microcluster, whereas the full width at half-maximum peak height of the intensity distribution in the x and y direction defines the size of each individual BCR microcluster. The FI and size information of each representative BCR microcluster was determined from the original image (Fig. 5A, top panel) or the images mathematically fitted to the 2D Gaussian function (Fig. 5A, middle and bottom panels). The comparison of hundreds of BCR microclusters clearly showed that Ags tethered to substrates with higher stiffness were more potent, inducing the formation of more prominent BCR microclusters that were brighter and larger (Fig. 5B, 5C). We also quantified the FI and size of pSyk microclusters. Similarly, we found that Ags tethered to substrates with higher stiffness induced formation of more prominent pSyk microclusters than did Ags presented on substrates with lower stiffness (Fig. 6), suggesting a boosted initiation of membrane proximal BCR signaling cascades. 2D Gaussian analyses of BCR microclusters induced by Ags tethered to substrates with high versus low stiffness. (A) Representative original (top panel), pseudo-colored 2D (middle panel), and 2.5D Gaussian images (bottom panel) of typical BCR microclusters induced by Ags tethered to substrates with high versus low stiffness. Scale bars, 1.5 μm. The FI and size of each microcluster upon 2D Gaussian fitting were used to quantify the BCR microclusters, as detailed in Materials and Methods. (B and C) Statistical comparison of FI (B) or size (C) of hundreds of BCR microclusters within the immunological synapse of Ramos B cells placed on Ag-tethered substrates with high versus low stiffness. Bars represent mean ± SEM of all the BCR microclusters analyzed (n is indicated in the inset symbol legend) from at least 50 cells that were acquired from three independent experiments. Two-tailed t tests were performed for statistical comparisons. All the end point images were acquired 10 min after the B cells were placed on Ag-containing polyacrylamide gels. 2D Gaussian analyses of pSyk microclusters induced by Ags tethered to substrates with high versus low stiffness. (A) Representative original (top panel), pseudo-colored 2D (middle panel), and 2.5D Gaussian images (bottom panel) of typical pSyk microclusters induced by Ags tethered to substrates with high versus low stiffness. Scale bars, 1.5 μm. The FI and size of each microcluster upon 2D Gaussian fitting were used to quantify the pSyk microclusters, as detailed in Materials and Methods. (B and C) Statistical comparison of FI (B) or size (C) of hundreds of pSyk microclusters within the immunological synapse of Ramos B cells placed on Ag-tethered substrates with high versus low stiffness. Bars represent mean ± SEM of pSyk microclusters analyzed (n is indicated in the insert symbol legend) from at least 50 cells that were acquired from three independent experiments. Two-tailed t tests were performed for statistical comparisons. All the end point images were acquired 10 min after the B cells were placed on Ag-containing polyacrylamide gels. 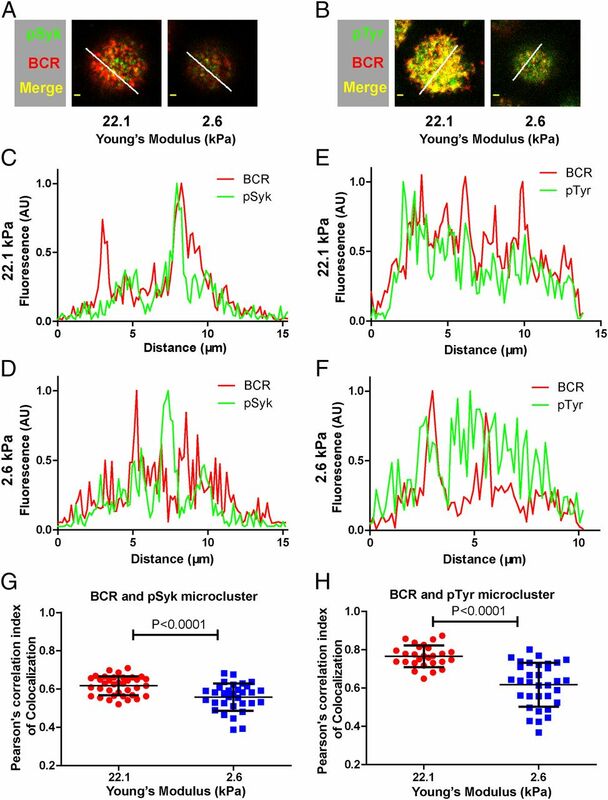 Early studies of ours and others showed that signaling-active BCR microclusters were usually well colocalized with membrane-proximal signaling microclusters, such as pSyk and pTyr microclusters (4, 15, 16, 33). We thus compared the spatial distribution of BCR microclusters to either pSyk or pTyr microclusters induced by Ags tethered to substrates with high or low stiffness using Pearson correlation index analysis as reported previously (4). These analyses indicated that BCR microclusters induced by Ags tethered to substrates with high stiffness were more signaling active by showing significantly enhanced colocalization to either pSyk or pTyr signaling molecule microclusters, as compared with BCR microclusters induced by Ags tethered to substrates with low stiffness (Fig. 7). 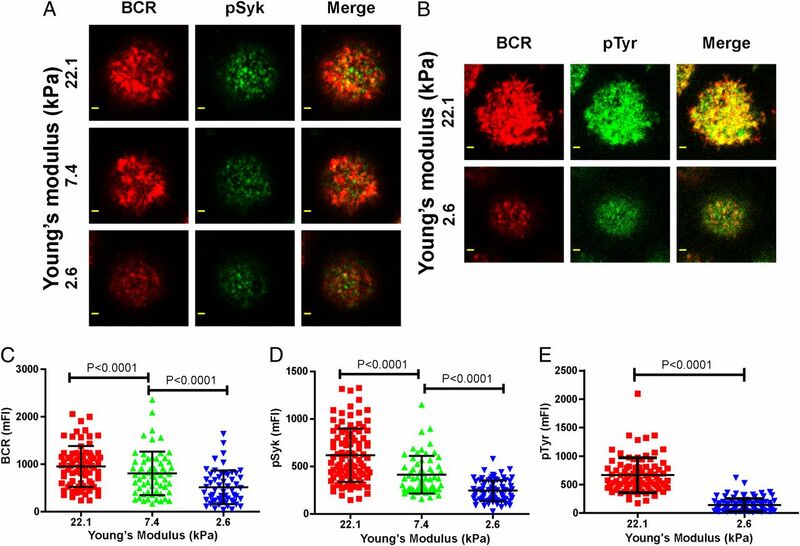 Colocalization analyses of BCR microclusters with either pSyk or pTyr microclusters. Ramos B cells were prestained with Alexa Fluor 568–conjugated Fab fragment anti-human IgM Abs, loaded on the Ag-presenting substrates with high or low stiffness, and examined by intracellular immunofluorescence staining for pSyk or pTyr microclusters. (A) Representative merged images of BCR (red) and pSyk (green) microclusters within the immunological synapse of Ramos B cells encountering Ags tethered to substrates with high versus low stiffness. Scale bar, 1.5 μm. (B) Representative merged images of BCR (red) and pTyr (green) microclusters within the immunological synapse of Ramos B cells encountering Ags tethered to substrates with high versus low stiffness. Scale bar, 1.5μm. (C and D) FI profiles from (A) show the BCR and pSyk localization of Ramos B cells encountering Ags tethered to substrates with high (C) or low (D) stiffness. (E and F) FI profiles from (B) show the BCR and pTyr localization of Ramos B cells encountering Ags tethered to substrates with high (E) or low (F) stiffness. (G and H) Pearson correlation index analyses were used to quantify the spatial distribution of BCR microclusters with either pSyk (G) or pTyr (H) microclusters from Ramos B cells encountering Ags tethered to the substrate with high or low stiffness. Each dot represents an individual measurement from a single B cell for colocalization analysis by ImageJ software. Bars represent mean ± SD from at least three independent experiments. Two-tailed t tests were performed for statistical comparisons. All the end point images were acquired 10 min after the B cells were placed on Ag-containing polyacrylamide gels. Thus the initiation of B cell activation is very sensitive to the stiffness features of the substrate presenting the Ags, suggesting that B cells have a mechanosensing ability that can efficiently regulate the early events in B cell activation. We also wanted to determine whether the B cell mechanosensing ability can be delivered to the nucleus and therefore affect the expression profiles for the genes responding to B cell activation. We thus measured expression of the B cell surface activation marker CD69, which is significantly increased upon Ag recognition by the BCRs as indicated in published studies (23–25, 34). In contrast to activation of Syk, the activation of CD69 takes place at the late stage of the BCR signaling transduction cascade, with a response occurring at the mRNA level through changes in the gene expression profile. Accordingly, to determine changes in CD69 expression, we thus incubated Ramos or mouse primary B cells in general culture medium with the planar polyacrylamide gels of high or low stiffness presenting surrogate Ags for an extended amount of time (24 h) and followed up with flow cytometry analyses. We found that B cells encountering Ags tethered to substrates with high stiffness showed significantly enhanced expression of the B cell activation marker CD69 as compared with B cells recognizing Ags tethered to substrates with low stiffness (Fig. 8). This effect was readily observed in mouse primary B cells (MFI of CD69 was 36.9 on B cells applied to substrates with high [22.1 kPa] stiffness versus 15.5 on substrates with low [2.6 kPa] stiffness) (Fig. 8A), although it was mild in Ramos human B cells (MFI of CD69 was 3.31 on substrates with high stiffness versus 2.17 on substrates with low stiffness) (Fig. 8B). The upregulation of CD69 upon Ag stimulation in human Ramos B cells is much weaker, consistent with previously published studies (35). Thus, it is clear that the mechanosensing ability of B cells can be delivered to the nucleus and can subsequently affect the expression profiles for the genes responding in B cell activation. Analyses of the surface expression of B cell activation marker CD69 on B cells encountering Ags tethered to substrates with high versus low stiffness. (A and B) Flow cytometry analyses for the B cell activation marker CD69 from mouse primary B cells (A) or Ramos human B cells (B) following 24 h incubation on Ag-containing substrates with high versus low stiffness. The MFI of CD69 is provided in the histogram plots as indicated. Data in (A) and (B) are representative of three independent experiments. Early studies from ours and those of others showed that there are dynamic but ordered molecular events in the initiation of B cell activation (1, 13). We then wanted to determine at which stage the B cells show a mechanosensing ability to distinguish substrates with high or low stiffness features, starting from BCR recognition of Ags. We applied high-speed time-lapse live cell imaging to address this question. Using spinning disk confocal microscopy, we captured with high temporal resolution the responses of Ramos human B cells placed on Ag-containing polyacrylamide gels with high or low stiffness (Fig. 9, Supplemental Video 1). By quantifying the amount of BCRs accumulated into the cell contact interface with the polyacrylamide gel, we determined that no significant difference was observed within the first 5 min after BCR recognition of the Ags (Fig. 9A). By doing linear fitting of the BCR MFI growth curves within the first 5 min, we found that the slopes of the two growth curves induced by Ags on stiff (22.1 kPa) or soft (2.6 kPa) substrates were comparable (3.814 versus 3.067). However, starting at ∼5–7 min, the Ag tethered to substrates with high stiffness began to dramatically promote the formation of BCR microclusters and the accumulation of BCRs into the immunological synapse. A similar linear fitting-based slope analysis indicated a dramatic difference with a slope value of 4.936 for stiff substrates versus a slope value of 1.979 for soft substrates (Fig. 9B). These results indicate that there is a certain amount of response time needed for B cells to employ their mechanosensing ability to distinguish substrate stiffness features after Ag recognition by the BCRs. In our experimental system, it seems that the B cells engage in mechanosensing for 5 min before the stiffness features of the substrate tethering the Ags can affect the B cell activation events. Time-lapse imaging of the accumulation of BCR microclusters into the immunological synapse of Ramos B cells encountering Ags tethered to substrates with high versus low stiffness. (A) Representative time-lapse images at the indicated time points showing the contact interface of Ramos B cells with Ag-presenting polyacrylamide gels having high versus low stiffness (also see Supplemental Video 1). Scale bar, 2 μm. (B) Statistical comparisons showing the dynamic accumulation of BCR microclusters into the immunological synapse during a time frame of 14 min. Bars represent mean ± SEM of 20 cells taken from three independent experiments. At the indicated time points, two-tailed t tests were performed for statistical comparisons and a p value is given. Linear fittings were also performed for the BCR MFI growth curves within the range of 0–5 min or time period after 5 min. Within the first 5 min, the slopes of the two growth curves induced by Ags on stiff (22.1 kPa) or soft (2.6 kPa) substrates were comparable (3.814 versus 3.067); however, after 5 min, the slope of the growth curve from stiff substrates is 2.5-fold greater than the slope from soft substrates (4.936 versus 1.979). In the experiments described thus far, we used IgG anti-IgM Abs as surrogate Ags for B cell activation. To test the general hypothesis that B cell activation events are regulated by the mechanosensing ability of B cells, we analogously assessed primary B cells from IgH B1-8/B1-8 Igk−/− transgenic mice (termed B1-8 primary B cells) (36). B1-8 primary B cells expressing B1-8 IgM-BCRs specifically recognize the hapten 4-hydroxy-3-nitrophenyl (NP) (37). We thus tethered biotin-conjugated NP8-BSA Ag on polyacrylamide gel surfaces with high or low stiffness features. We detected the accumulation of IgM-BCRs on B1-8 primary B cells into the immunological synapse to double-check our observations that the accumulation of BCRs is sensitive to stiffness of substrate. 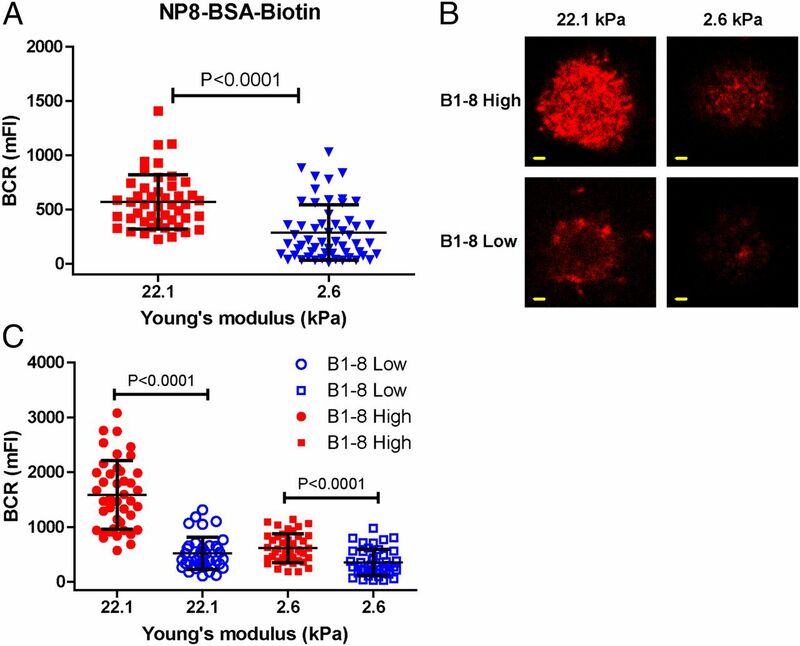 These results confirmed that B1-8 primary B cells show an obvious mechanosensing ability to determine the stiffness features of the substrate presenting NP8-BSA Ags (Fig. 10A). Our conclusion is consistent with the observation that B cells respond much more readily to surrogate Ags tethered to substrates with high stiffness. The mechanosensing ability of B cells helps BCRs to exert affinity discrimination. 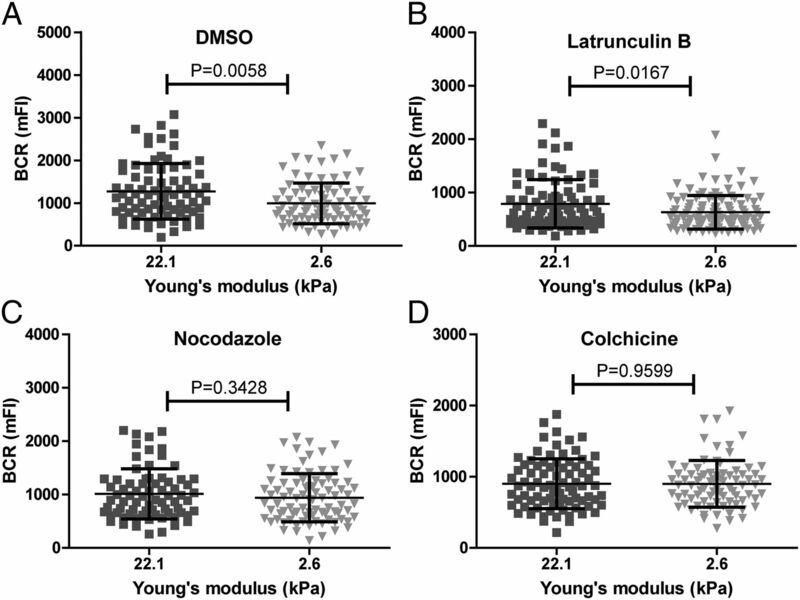 (A) Statistical quantification of the MFI of BCRs within the immunological synapse of primary B cells from B1-8 Tg mice on polyacrylamide gel substrates with high versus low stiffness. Each dot shows one cell analyzed in three independent experiments. Bars represent mean ± SD. Two-tailed t tests were performed for the statistical comparisons. (B) Representative images showing the accumulation of BCRs within the immunological synapse of J558L cells expressing B1-8-high IgM-BCRs (top panel) or B1-8-low IgM-BCRs (lower panel) that were placed on the Ag-presenting substrates with high (left panel) versus low stiffness (right panel). Scale bar. 2 μm. (C) Statistical quantification of the MFI of BCR within the immunological synapse of J558L cells expressing IgM-BCRs in B1-8-high or B1-8-low version that were placed on the Ag-presenting substrate with high versus low stiffness. Each dot shows one cell analyzed in three independent experiments. Bars represent mean ± SD. Two-tailed t tests were performed for the statistical comparisons. All the end point images were acquired 10 min after the B cells were placed on Ag-containing polyacrylamide gels. Moreover, an important function of BCRs in B cell activation is to perform affinity discrimination (1). We were thus curious to determine whether affinity discrimination of BCRs will be regulated by the mechanosensing ability of B cells. To do so, we used J558L cells expressing reconstructed B1-8-high or B1-8-low IgM-BCRs as reported in our early studies (4, 30). Early biochemical studies suggested that the affinities (Ka) of B1-8-high and B1-8-low Ab to NP are 5 × 106 and 1.25 × 105 M−1, respectively, a 40-fold difference (38–40). By tethering biotin-conjugated NP8-BSA Ags to polyacrylamide gels with high or low stiffness features, we assessed the accumulation of IgM-BCRs into the immunological synapse. The results suggest that both B1-8-high and B1-8-low IgM-BCRs expressing J558L cells maintained mechanosensing capabilities well (Fig. 10B, 10C). Importantly, we noticed that B1-8-high IgM-BCRs showed a 3.06-fold enrichment in the immunological synapse as compared with B1-8-low IgM-BCRs when recognizing the same NP8-BSA Ags tethered to substrates with high stiffness (22.1 kPa) (Fig. 10B, 10C). In contrast, we only observed a 1.73-fold enrichment of B1-8-high IgM-BCRs compared with B1-8-low IgM-BCRs when recognizing Ags tethered to substrates with low stiffness (2.6 kPa) (Fig. 10B, 10C). Thus, it is interesting to know that BCRs demonstrate much stronger affinity discrimination ability when recognizing Ags presented on substrates with high stiffness as compared with Ags presented on substrates with low stiffness. Next, we attempted to identify the molecular mechanism of the mechanosensing ability of BCRs. Because the membrane cytoskeleton, including actin and microtubule network, have been demonstrated to regulate cell mechanics and polarized morphology in published studies (17–19), we chose to evaluate the contribution of actin and the microtubule network to the mechanosensing ability of BCRs. We used the actin polymerization inhibitor latrunculin B to pretreat Ramos B cells to disrupt actin filaments as reported previously (4). We then placed these pretreated Ramos B cells on Ag-containing polyacrylamide gels with high or low stiffness. We first evaluated the ability of these pretreated B cells to acquire Ags when encountering Ag tethered to substrates with either high or low stiffness. As expected, such ability was significantly impaired when the actin cytoskeleton was disrupted, as quantified by the amount of BCRs accumulated into the B cell immunological synapse (Supplemental Fig. 2A, 2B) and the size of the B cell contact area with the Ag-containing gels (Supplemental Fig. 2C, 2D). This builds upon our study reporting that the initiation of BCR signaling and the growth of BCR microclusters in response to Ags tethered to planar fluid lipid bilayers were severely impaired by latrunculin B treatment (4). We then compared the response of BCRs to Ags tethered to substrates with high versus low stiffness. We found that Ramos B cells pretreated with latrunculin B still showed an enhanced response upon encountering Ags tethered to substrates with high stiffness as compared with Ags tethered to substrates with low stiffness (p = 0.0167) (Fig. 11A, 11B). However it is clear that the mechanosensing ability of B cells was slightly impaired in B cells with disrupted actin filaments, as the Ramos B cells pretreated with DMSO, rather than latrunculin B, exhibited better mechanosensing ability (p = 0.0058) (Fig. 11A, 11B). Moreover, we compared the contact area of Ramos B cells with the Ag-containing polyacrylamide gel substrates. Ramos B cells encountering Ags on substrates with high stiffness showed an obviously larger contact area as compared with Ags on substrates with low stiffness (p < 0.0001) (Fig. 12A, 12B). These results were observed in both the DMSO control and the latrunculin B–pretreated B cells (p < 0.0001) (Fig. 12A, 12B), suggesting that the actin cytoskeleton contributes only mildly to the mechanosensing ability of B cells. 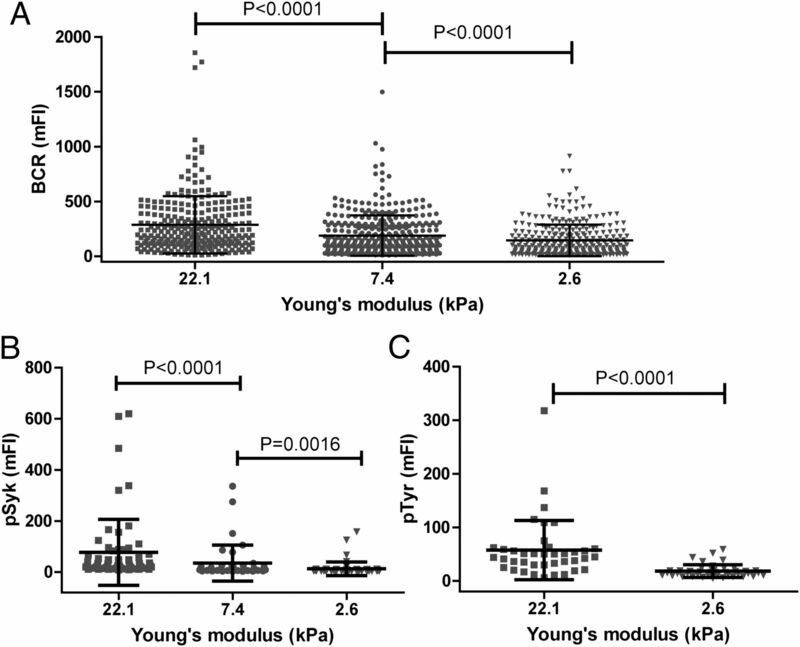 Accumulation of BCRs into the immunological synapse of Ramos B cells pretreated with cytoskeleton inhibitors prior to encountering Ags tethered to substrates with high versus low stiffness. 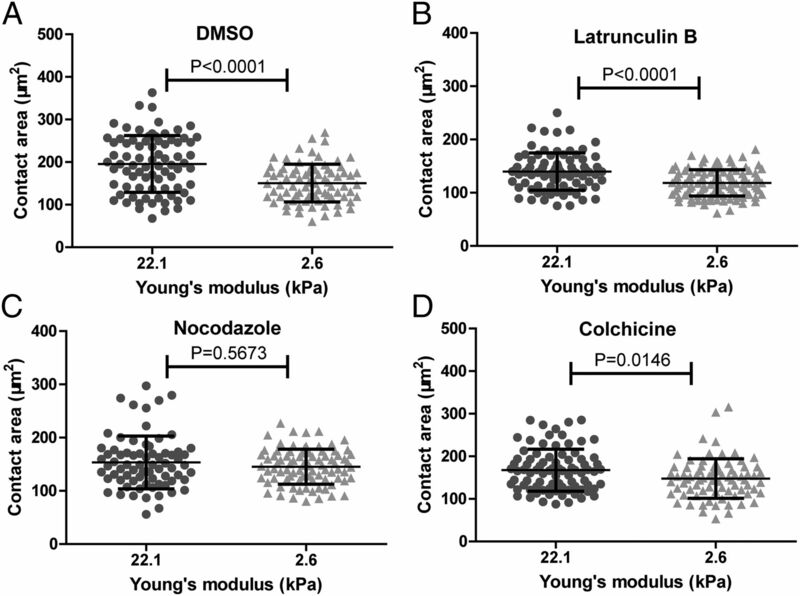 (A–D) Ramos B cells were pretreated with DMSO (A), latrunculin B (B), nocodazole (C), or colchicine (D) and placed on Ag-presenting polyacrylamide gel substrates with high versus low stiffness. Pretreatment with various inhibitors and the measurement of BCRs in the B cell immunological synapse are detailed in Materials and Methods. Each dot shows one measurement from a single cell. Bars represent mean ± SD. Two-tailed t tests were performed for statistical comparisons. All the end point images were acquired 10 min after the B cells were placed on Ag-containing polyacrylamide gels. Contact area of Ramos B cells pretreated with cytoskeleton inhibitors prior to encountering Ags tethered to substrates with high versus low stiffness. (A–D) Ramos B cells were pretreated with DMSO (A), latrunculin B (B), nocodazole (C), or colchicine (D) and placed on Ag-presenting polyacrylamide gel substrates with high versus low stiffness. Pretreatment with various inhibitors and the measurement of B cell contact area are detailed in Materials and Methods. Each dot shows one measurement from a single cell. Bars represent mean ± SD. Two-tailed t tests were performed for statistical comparisons. All the end point images were acquired 10 min after the B cells were placed on Ag-containing polyacrylamide gels. Using a similar approach, we evaluated the contribution of the microtubule network to the mechanosensing ability of the BCR. We disrupted microtubules by pretreating Ramos B cells with the microtubule polymerization inhibitor nocodazole as reported earlier (4). We then imaged and analyzed the response of these pretreated B cells to Ags tethered to polyacrylamide gels with high versus low stiffness. The results suggest that the Ramos B cells pretreated with nocodazole completely lost their mechanosensing ability, accumulating comparable amounts of BCR into the B cell immunological synapse (Fig. 11C, p = 0.3428) and showing a similar contact area when encountering Ags on substrates with high stiffness versus low stiffness (Fig. 12C, p = 0.5673). Because published studies have indicated that nocodazole can inhibit other molecules independent of its effects on the microtubule network (41), we pretreated Ramos B cells with another type of microtubule inhibitor, colchicine, to disrupt microtubule polymerization. The effects of colchicine on the formation of the B cell immunological synapse were similar to those obtained using nocodazole (Figs. 11D, 12D), suggesting that the mechanosensing ability of B cells is more dependent on the microtubule network than on the actin cytoskeleton. In this study, we show that B cells have excellent mechanosensing ability to survey the stiffness features of the substrate presenting the Ags and such ability in turn efficiently regulates B cell activation events upon Ag recognition by BCRs. It is perhaps not surprising that B cells can perform mechanosensing, as almost all types of cells have such capability (42). However, we think that it is interesting to discover that the B cell responses induced by Ag recognition by BCRs, similar to early B cell activation events, are efficiently subjected to regulation by the mechanosensing ability of the B cell. It is well known that B cells function to search for evaded Ags. The substrate harboring Ags can be very diverse by nature, and thus the stiffness features of these substrates can be highly different, as described in detail in the Introduction (22). Two extreme samples include rigid virus capsid that is usually very stiff and body fluid containing secreted pathogen Ags that is extremely soft. Recent progress of advanced intravital imaging techniques has demonstrated that B cells can be activated by Ags that are captured on the plasma membrane of APCs. For example, viruses and immune complexes are mainly presented to B cells by macrophages, dendritic cells lining the subcapsular sinuses, and the well-appreciated follicular dendritic cells (43–46). When investigating the activation of B cells upon recognition of these types of membrane-bound Ags, the stiffness features of both APCs and B cells cannot be neglected, as complex membrane structures involving multiple receptors, ligands, and signaling molecule interactions, now referred to as the immunological synapse, will form between the membrane interface of APCs and B cells (47). It is well documented that the immunological synapse plays essentials roles in regulating B cell activation, whereas the formation and maturation of the immunological synapse are likely to be affected by the stiffness features of the substrate presenting the Ags and the B cell itself. This type of speculation is supported by recent studies that the membrane and cytoskeleton of a cell maintain its tension features. These tension features are closely linked to the formation of cell polarity (17, 18, 48–50), whereas the B cell immunological synapse is a highly polarized structure. It is not completely clear whether the stiffness of a cell is linked to the tension features of its membrane and cytoskeleton, but it is well documented that both lipid raft membrane domains and membrane cytoskeletons play pivotal roles in the formation of the B cell immunological synapse. In this study, we established an experimental system to use common polyacrylamide gel substrates with variable Young’s modulus (22.1, 7.4, and 2.6 kPa respectively) to present Ag. To capture the early events of B cell activation, seconds after the recognition of Ags tethered to substrates with varying stiffnesses, we used high-resolution, high-speed live cell imaging techniques to examine the B cell response. Our experiments showed that when B cells encounter Ags tethered to substrates with higher stiffness, they demonstrated significantly enhanced accumulation and recruitment of BCR, pSyk, and pTyr signaling molecules into the B cell immunological synapse as compared with B cells recognizing Ags tethered to substrates with lower stiffness. The enhanced initiation of BCR signaling is transmitted to the nucleus and affects downstream gene expression profile changes as quantified by the enhanced expression of the B cell activation marker CD69. These results suggest that B cells have mechanosensing ability and such capability can efficiently regulate B cell activation events. Our observation in this study mirrors the findings of a recent study by Kam and colleagues (20), who investigated the mechanosensing features of T lymphocyte cells. Their studies demonstrated that within a stiffness range between 10 and 100 kPa, the activation of T cells was obviously enhanced upon increasing substrate stiffness, as quantified by IL-2 secretion and phosphorylated Src family kinases and ZAP70 recruitment to the immunological synapse. However, for substrate stiffness >100 kPa, the activation of T cells did not seem to be enhanced, but was instead somewhat impaired (20). These results and speculations were further supported by a recent study by Milone and colleagues (21). Using polydimethylsiloxane (PDMS) substrates, they were able to produce substrate stiffnesses ranging from 100 to 8000 kPa. They extensively compared T cell activation, proliferation, and differentiation when cultured on an extremely stiff PDMS surface of ∼8000 kPa and a relatively softer PDMS surface of ∼100 kPa. Indeed, they found that when increasing stiffness >100 kPa, T cell activation was actually impaired, and this was especially the case when comparing substrates with stiffness of 8000 versus 100 kPa. Note that both B and T lymphocyte cells are not likely to encounter Ags tethered to a surface with a stiffness as high as 8000 kPa in vivo, although in general in vitro biochemical studies the surfaces of plastic culture plates or glass coverslides can exhibit stiffnesses that high. It is also well known that when coating Ags on substrate surfaces with extremely high stiffness, B or T lymphocyte cells can be readily activated. From a physiological point of view, the commonly used polyacrylamide gel substrate can produce a surface stiffness value that lymphocyte cells are most likely to encounter in vivo, as it is well documented that the stiffness of polyacrylamide gel can be controlled between 150 Pa and 150 kPa, a range well covering the stiffness of most tissues within the human body (1–50 kPa) (32, 51–53). 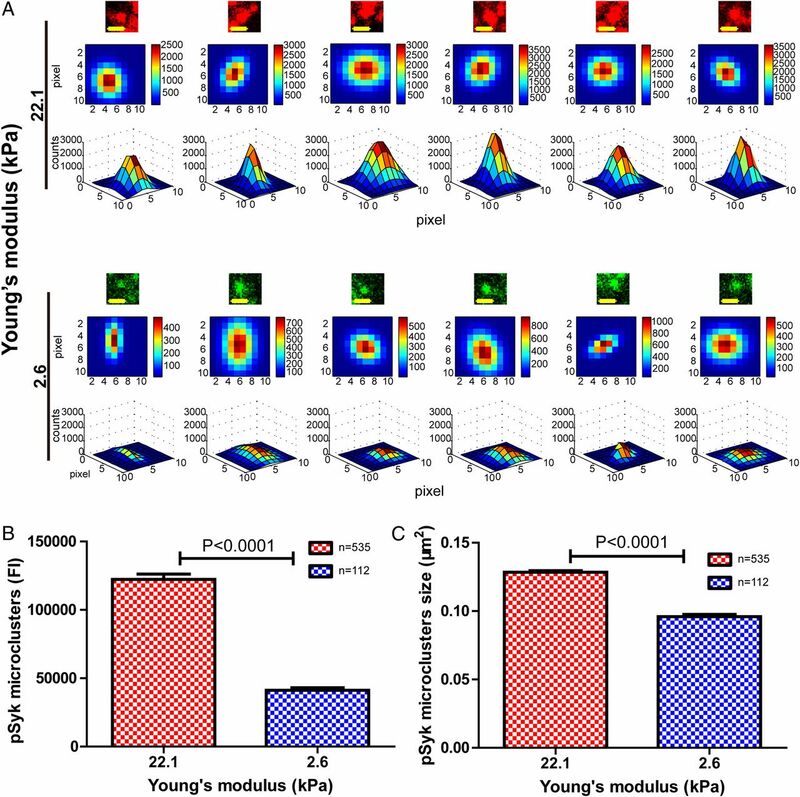 Thus, we think that the range of 2.6–22.1 kPa used in this study fits well with the range of substrate stiffnesses that B cells are likely to encounter in vivo, and within this range, our data show that B lymphocyte cells demonstrate obviously enhanced activation responses when recognizing Ags tethered to substrate with high stiffness. A follow-up question is how can B cells distinguish Ag-containing substrates with high versus low stiffness? This question is even more intriguing considering that we did not include any typical adhesive ligand molecules, such as ICAM-1, on the surface of the polyacrylamide gels. We simply tethered anti-IgM surrogate Ags or NP8-BSA Ags to the surface of polyacrylamide gels. Our experimental system is very similar to the system used by Kam and colleagues (20) in which IgG anti-CD3 and anti-CD28 surrogate Ags were tethered to polyacrylamide gels, or to the system used by Milone and colleagues (21) in which IgG anti-CD3 and anti-CD28 surrogate Ags were tethered to PDMS gels. In their systems, no adhesive ligands were used, but in both cases, T cells similarly showed strong mechanosensing abilities. These results from T cells studies and the results of B cell studies presented in this study show that for lymphocyte cells, the mechanosensing abilities may not solely function through conventional ICAM-1 and LFA-1 interactions, where LFA-1 serves as a well-established mechanosensor. However, note that the potential contribution of ICAM-1 and LFA-1 interactions to maintaining and regulating the mechanosensing ability of lymphocyte cells cannot be neglected, as there are many early studies showing that ICAM-1 and LFA-1 interactions can fine-tune the adhesion and activation of both B and T lymphocyte cells (54–60). From this point of view, it will be very interesting to investigate the exact role of ICAM-1 and LFA-1 interactions in regulating the mechanosensing ability of B cells. We have some speculations about how B cells can perform mechanosensing functions even under conditions where only Ags but no ICAM-1 adhesion molecules are tethered to the surface of the substrates. Early cell biological studies have reported that the focal adhesions between the opposing plasma membranes of the cell-to-cell contact interface can themselves serve as mechanosensors (61). Within these focal adhesions, the mechanical features of the extracellular matrix can be transmitted across the membrane to the membrane-proximal cytoskeleton to activate cytoplasmic signaling proteins (61). When B cells encounter membrane-bound Ags presented by APCs, a typical focal adhesion structure referred to as the immunological synapse forms (1). Is it possible that the B cell immunological synapse functions as the mechanosensor here? In this study, using a series of optical imaging-based techniques, we captured the dynamic molecular events in the formation of the B cell immunological synapse, including the formation and growth of BCR microclusters, the recruitment of signaling molecule pSyk and pTyr microclusters, and the coalescence of these microclusters (1). By comparing hundreds of BCR microclusters induced by Ags tethered to substrates with high or low stiffness, we determined that the Ags tethered to substrates with high stiffness are more potent and induced the formation of more prominent BCR microclusters that contain more BCRs and Ags. Similarly, when quantifying the FI and size of pSyk microclusters, we determined that Ag tethered to substrates with high stiffness induced the formation of more prominent pSyk microclusters that are much larger and brighter than those induced by Ags tethered to substrates with low stiffness. More importantly, BCR microclusters showed enhanced colocalization to either pSyk or pTyr microclusters in the case of B cells encountering Ags tethered to substrates with high stiffness. All of these data suggest that the typical events involved in the formation and maturation of the B cell immunological synapse are very sensitive to the stiffness feature of substrates presenting the Ags, although no typical adhesive molecules such as ICAM-1 are tethered to that very substrate. These experiments do not lead us to the conclusion that B cells perform mechanosensing by using the immunological synapse as the mechanosensor machinery, as we cannot exclude the possibility that these events in the formation and maturation of the B cell immunological synapse are actually regulated by the mechanosensing capability of B cells through some other unidentified mechanosensor machinery. It will be very interesting to investigate the molecular nature of the mechanosensor machinery to distinguish the stiffness features of substrates without tethered ICAM-1 adhesion molecules, as is the case for B cells in the present study and for T cells in the published studies from Kam and colleagues and from Milone and colleagues. Another intriguing observation from our report is that the Ag-independent adhesion of B cells to polyacrylamide gel substrates is even more striking in human Burkitt’s lymphoma Ramos B cells (∼80% adhesion) as compared with the case of freshly isolated mouse primary B cells (∼50% adhesion). Although it is known that tumor cells may significantly change their adhesive features (32), the molecular mechanism of the Ag-independent adhesion of tumor B cells and its function in B cell tumorigenesis deserve further investigation. We are just beginning to learn about the mechanosensing ability of B cells. Two interesting features are clear based on this study. First, a response time of 5 min is needed for B cells to show an obvious ability to distinguish substrate stiffness. Through time-lapse live cell imaging, we determined that the differences in B cell responses were not evident until 5 min after BCRs encountered Ags tethered to substrates with variable stiffnesses. Second, not all of the receptors and cytoskeleton networks involved in lymphocyte activation are associated with the mechanosensing ability of lymphocyte cells. The study of Kam and colleagues (20) on T cells showed that the mechanosensing ability of T cells is more strongly associated with TCR CD3 molecules rather than the costimulatory molecule CD28. In our studies, B cell mechanosensing ability is found to be more dependent on the microtubule network, but it is only mildly linked to the actin cytoskeleton, suggesting that the mechanosensor machinery may likely rely on the microtubule rather than the actin cytoskeleton system. Although actin is not closely involved in the mechanosensing ability of B cells, it is clear that the actin cytoskeleton plays important supporting roles in the formation of the B cell immunological synapse. Indeed, in this study we find that the ability of B cells to acquire Ags when encountering Ags tethered to substrates with either high or low stiffness is significantly impaired when the actin cytoskeleton is disrupted. This builds upon our published study and studies of others reporting that the accumulation of BCRs into the B cell immunological synapse in response to Ags tethered to planar fluid lipid bilayers is basically blocked by latrunculin B treatment (4). Overall, the mechanosensing and mechanotransducing abilities of B cells obviously deserve further investigation, as these studies can enhance our understanding of B cell activation upon Ag recognition and may help us to build better vaccines and cure diseases that are induced by hyper– or hypo–B cell activation, such as B cell tumors and certain types of autoimmune diseases. We thank Dr. Susan K. Pierce (National Institute of Allergy and Infectious Diseases, National Institutes of Health), Dr. Klaus Rajewsky (Immune Regulation and Cancer, Max Delbrück Center for Molecular Medicine), and Dr. Mark Shlomchik (Yale University) for providing experimental materials. We thank Dr. Yan Shi at the University of Calgary for critical reading and helpful suggestions on the manuscript. We thank Dr. Dong Han at the National Center for Nanoscience and Technology of China for assistance with mechanical testing of polyacrylamide gels. Wanli Liu gives heartfelt thanks to Dr. Susan K. Pierce for her inculcated mentoring in his postdoctoral studies. This work was supported by Ministry of Science and Technology of China Grant 2013CB933702 (to C.X. ), National Science Foundation China Grants 31270913 (to W.L. ), 11272015 (to C.X. ), and 81230061 (to W.H. ), Beijing Natural Science Foundation Grant 5132016 (to W.L. ), Ph.D. Programs Foundation of Ministry of Education of China Grant 20120002120007 (to W.L. ), New Century Excellent Talents in University of Ministry of Education of China Grant NCET-12-0299 (to W.L. ), and by the Tsinghua University–Gates Foundation.
. 2010. The tipping points in the initiation of B cell signalling: how small changes make big differences. Nat. Rev. Immunol. 10: 767–777.
. 2000. Monomeric and oligomeric complexes of the B cell antigen receptor. Immunity 13: 5–14.
. 2005. The initiation of antigen-induced B cell antigen receptor signaling viewed in living cells by fluorescence resonance energy transfer. Nat. Immunol. 6: 1168–1176.
. 2010. Antigen affinity discrimination is an intrinsic function of the B cell receptor. J. Exp. Med. 207: 1095–1111.
. 2006. B cell ligand discrimination through a spreading and contraction response. Science 312: 738–741.
. 1993. The influence of antigen organization on B cell responsiveness. Science 262: 1448–1451.
. 2005. High epitope density in a single protein molecule significantly enhances antigenicity as well as immunogenicity: a novel strategy for modern vaccine development and a preliminary investigation about B cell discrimination of monomeric proteins. Eur. J. Immunol. 35: 505–514.
. 2004. High epitope density in a single recombinant protein molecule of the extracellular domain of influenza A virus M2 protein significantly enhances protective immunity. Vaccine 23: 366–371.
. 2012. The growth of B cell receptor microcluster is a universal response of B cells encountering antigens with different motion features. Protein Cell 3: 545–558.
. 2007. Activating B cell signaling with defined multivalent ligands. ACS Chem. Biol. 2: 252–262.
. 2010. Low-valency, but not monovalent, antigens trigger the B-cell antigen receptor (BCR). Int. Immunol. 22: 205–212.
. 2006. Monovalent ligation of the B cell receptor induces receptor activation but fails to promote antigen presentation. Proc. Natl. Acad. Sci. USA 103: 3327–3332.
. 2010. Early events in B cell activation. Annu. Rev. Immunol. 28: 185–210.
. 2011. Dynamic cortical actin remodeling by ERM proteins controls BCR microcluster organization and integrity. J. Exp. Med. 208: 1055–1068.
. 2011. B cell receptor-mediated antigen gathering requires ubiquitin ligase Cbl and adaptors Grb2 and Dok-3 to recruit dynein to the signaling microcluster. Immunity 34: 905–918.
. 2010. The membrane skeleton controls diffusion dynamics and signaling through the B cell receptor. Immunity 32: 187–199.
. 2008. Mechanism of shape determination in motile cells. Nature 453: 475–480.
. 2007. Model of polarization and bistability of cell fragments. Biophys. J. 93: 3811–3819.
. 2012. Cell mechanics, structure, and function are regulated by the stiffness of the three-dimensional microenvironment. Biophys. J. 103: 1188–1197.
. 2012. Mechanosensing in T lymphocyte activation. Biophys. J. 102: L5–L7.
. 2012. Substrate rigidity regulates human T cell activation and proliferation. J. Immunol. 189: 1330–1339.
. 1994. The CD69 receptor: a multipurpose cell-surface trigger for hematopoietic cells. Immunol. Today 15: 479–483.
. 1990. CD69 is expressed on platelets and mediates platelet activation and aggregation. J. Exp. Med. 172: 701–707.
. 1999. Kinetics of cytokine release and expression of lymphocyte cell-surface activation markers after in vitro stimulation of human peripheral blood mononuclear cells with Streptococcus pneumoniae. Scand. J. Immunol. 49: 237–243.
. 1997. Cell locomotion and focal adhesions are regulated by substrate flexibility. Proc. Natl. Acad. Sci. USA 94: 13661–13665.
. 2007. 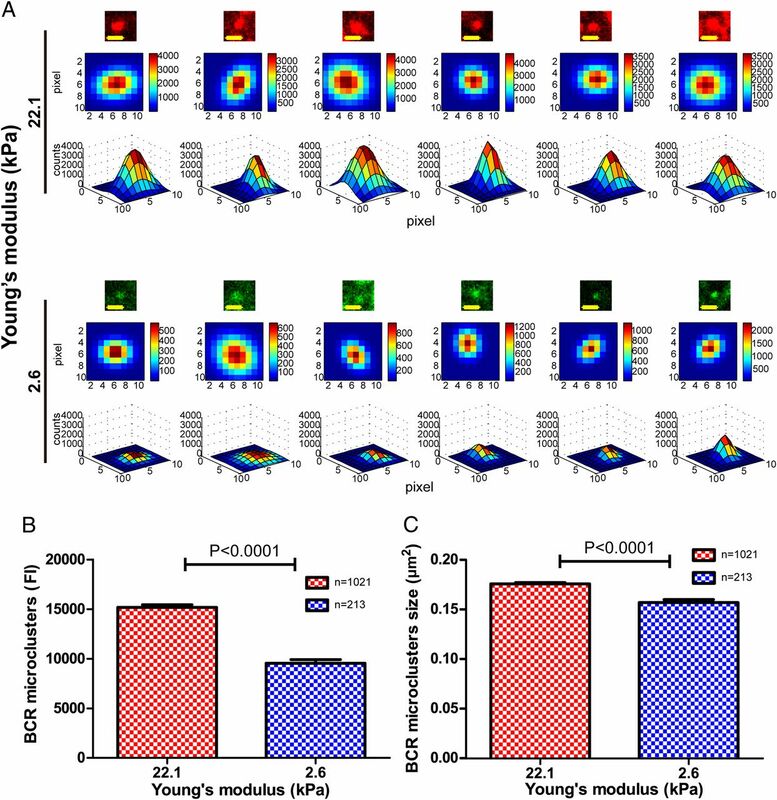 Dynamical stress characterization and energy evaluation of single cardiac myocyte actuating on flexible substrate. Biochem. Biophys. Res. Commun. 360: 352–356.
. 2012. Influence of substrate rigidity on primary nucleation of cell adhesion: a thermal fluctuation model. J. Colloid Interface Sci. 366: 200–208.
. 2011. Elasticity of cardiac cells on the polymer substrates with different stiffness: an atomic force microscopy study. Phys. Chem. Chem. Phys. 13: 7540–7545.
. 2010. Intrinsic properties of immunoglobulin IgG1 isotype-switched B cell receptors promote microclustering and the initiation of signaling. Immunity 32: 778–789.
. 2007. Nanometric three-dimensional tracking of individual quantum dots in cells. Appl. Phys. Lett. 90: 053902.
. 2009. A tense situation: forcing tumour progression. Nat. Rev. Cancer 9: 108–122.
. 2008. CD19 is essential for B cell activation by promoting B cell receptor-antigen microcluster formation in response to membrane-bound ligand. Nat. Immunol. 9: 63–72.
. 2009. The constant region of the membrane immunoglobulin mediates B cell-receptor clustering and signaling in response to membrane antigens. Immunity 30: 44–55.
. 2007. Definition of germinal-center B cell migration in vivo reveals predominant intrazonal circulation patterns. Immunity 26: 655–667.
. 1997. B cell development under the condition of allelic inclusion. Immunity 6: 225–233.
. 1988. Antibody engineering for the analysis of affinity maturation of an anti-hapten response. EMBO J. 7: 1995–2001.
. 1998. Nocodazole inhibits signal transduction by the T cell antigen receptor. J. Biol. Chem. 273: 12024–12031.
. 2005. Tissue cells feel and respond to the stiffness of their substrate. Science 310: 1139–1143.
. 2007. Subcapsular sinus macrophages in lymph nodes clear lymph-borne viruses and present them to antiviral B cells. Nature 450: 110–114.
. 2012. Receptor signaling clusters in the immune synapse. Annu. Rev. Biophys. 41: 543–556.
. 2012. Membrane tension maintains cell polarity by confining signals to the leading edge during neutrophil migration. Cell 148: 175–188.
. 2011. Target-specific mechanics of phagocytosis: protrusive neutrophil response to zymosan differs from the uptake of antibody-tagged pathogens. J. Cell Sci. 124: 1106–1114.
. 1989. Capping of surface receptors and concomitant cortical tension are generated by conventional myosin. Nature 341: 549–551.
. 2010. Synthetic materials in the study of cell response to substrate rigidity. Ann. Biomed. Eng. 38: 2–20.
. 2012. Patterning methods for polymers in cell and tissue engineering. Ann. Biomed. Eng. 40: 1339–1355.
. 2010. Measuring traction forces in long-term cell cultures. Cell. Mol. Bioeng. 3: 40–49.
. 2008. T cell-dendritic cell immunological synapses contain TCR-dependent CD28-CD80 clusters that recruit protein kinase C theta. J. Immunol. 181: 4852–4863.
. 2006. T cell-dendritic cell immunological synapses. Curr. Opin. Immunol. 18: 512–516.
. 2008. Regulation of integrin activation through the B-cell receptor. J. Cell Sci. 121: 2279–2286.
. 2003. The B cell antigen receptor controls integrin activity through Btk and PLCgamma2. J. Exp. Med. 198: 1539–1550.
. 2008. Activation of the small GTPase Rac2 via the B cell receptor regulates B cell adhesion and immunological-synapse formation. Immunity 28: 88–99.
. 2008. Rapid signal transduction in living cells is a unique feature of mechanotransduction. Proc. Natl. Acad. Sci. USA 105: 6626–6631.